RACE FANS!! Are you ready to see the fastest Sprint Cars on the planet!!?? Over 900 horse power 410 Tony Stewart All Star Circuit of Champions Sprint Car Series. Plus on the race program for that evening will be The Mighty Modifieds racing for $2500.00 to win The Outlaw Sportsman Series with $1500.00 to win, Street Stocks winners receiving $1000.00 to win, The 4 cylinders $600.00 to win and rounding out the evening activities will be the the Hobby Stocks racing for $500.00 to win. Outlaw Speedway will also have their famous Chicken BBQ. FREE WEEKEND CAMPING.. Go to OUTLAW'S web page for more information. brewerton super dirt big blocks the same night. First night of Oshweken Sprint Car Nationals are that date. 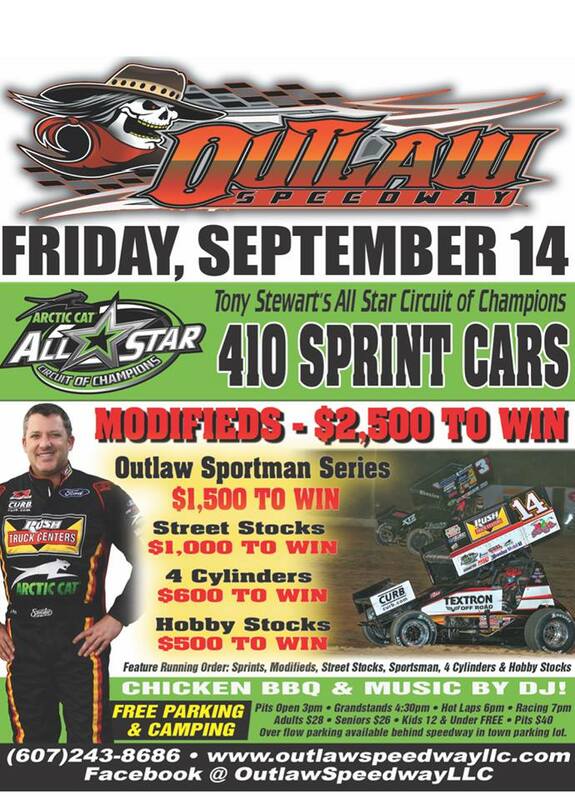 It's going to be a exciting Friday night at Outlaw Speedway. For the 2nd time this year the ALL-STAR CIRCUIT of CHAMPIONS will be digging the dirt featuring our own Modifieds,Sportsman,Street Stocks, Hobby Stocks and Mini Stocks. See you there! Well heavy chevy start a discussion for Brewerton and send updates please it's not a competition let's go racing somewhere. Free Parking & Camping (Overflow parking available behind speedway in town parking lot). Will have some sort of updates here. doubt we will see any PA guys this time. The Grove has the Al Hamilton tribute race and Dirt Classic Qualifier. Can anybody provide more info on the Brewerton show? Thanks! Irv's Taking The Night Off.